Dawes County Journal: Remembering KCSR - 1450 on the Dial! The holidays have a way of allowing us to make contact with kindred souls we’ve not seen or visited with for many years. It occurred to me it would be fun to try to pull together a few old photographs from those years. That’s a sample up above – Cliff Pike and Bob Fouse frolicking around on Breakfast with the Boys, which aired in the mid-1950s, shortly after the station went on the air. In coming weeks, I’ll be posting the few photos I have in a KCSR Gallery and encouraging others to join the fray! If you have some you’re willing to share, please drop me an e-mail. 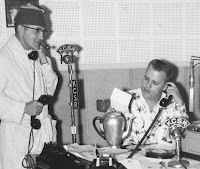 KCSR trivia question #1: Bill Finch and Bob Fouse put KCSR on the air in May 1954. They already had a few years of broadcasting experience under their belts when they arrived in Chadron. Where had they been?